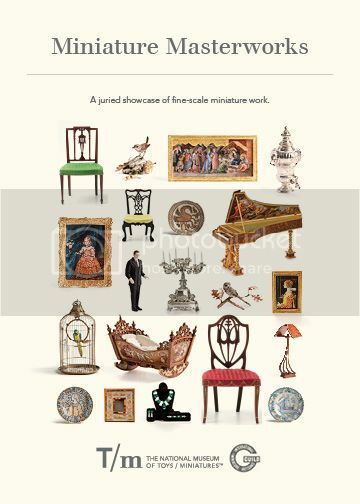 Miniature Masterworks is special event sponsored by the National Museum of Toys/miniatures and the I.G.M.A. to be held in Kansas City, Mo. USA in September of 2017. So excited for this event!!!! Just a reminder, a little over three weeks left to apply! Remember, there is $ 30,000 in award money to passed out! Just a note about something a couple folks miss understood, the questions and pictures about your work are your PASSED WORK, not what you are going to do a year and half from now. The jury process to get into the show is based on your past work, once you are selected you can make and bring whatever fantastic new thing you can think of. Just another reminder, about 2 weeks left to apply! I understand the museum will send out the notifications of the artists selected to participate in MM tomorrow! It was very competitive as so many great people applied and there was only a limited amount of space! I am so excited, just got an email to say that I was chosen to a dealer at Miniature Masterworks. This will also be my first show as a dealer! I have lots of ideas but nothing made yet, so I better get to work. I have been cleaning and reorganizing my work room since I got home from the Cape two weeks ago...that feels good. Also came home with 12kg's of the most beautiful indigenous South African wood that will be made into miniatures for the show. I just want to say thank you to the organizers for giving me this opportunity to be part of this fantastic event. Congratulations Elga! I hope you are still considering making that desk. The one I sent you a photo of. Thank you Catherine, and thank you for reminding me of that fabulous desk. I hope you are going to come to the show! I sure would like to come!!! And - then the following week is the Guild Show at its new location in Ct.. I'm looking forward to attending; have to find out if anyone is going with me so I can make my hotel reservations. The dealer list for the Miniature Masterworks show has been published on the Guild's website. The Barbara Marshall Award for Artistic Achievement will honor three of the show's artists with large cash prizes for creating special works that "push the envelope" for fine miniatures. This will give the artists a chance to make that special piece they've had in mind, or maybe to try something they haven't done before. All works entered in the contest must be for sale at Miniature Masterworks, and all will be on display for the entire weekend. Several artists have already told us they have begun work on their contest entries. Don't miss this opportunity to see (and purchase) some truly incredible pieces! I have a question regarding the competition. Must every part be made by the artist? For example may a furniture maker use bought hardware that were made by people like CatsPaw and others? Another example might be a doll made and dressed by the artist with a jewelry piece made by somebody else. 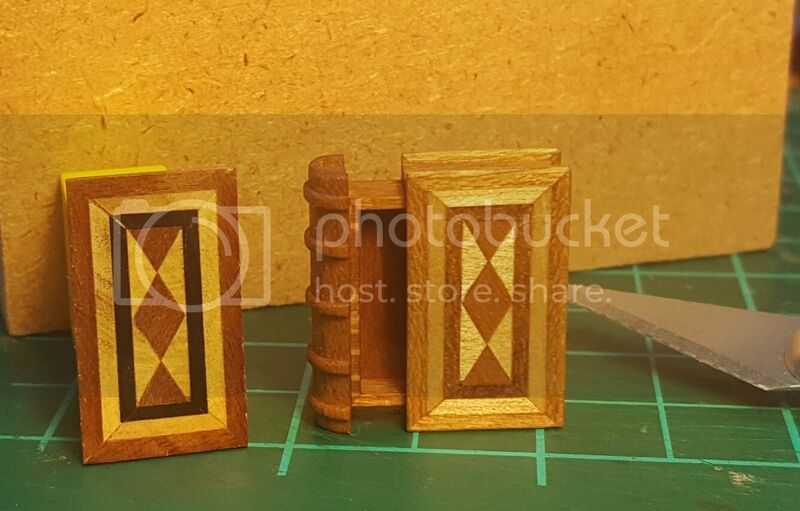 While I am not a judge, nor in this completion (and I'm relieved about both of those) I would guess the same standards that apply to the best miniatures would apply here. That is yes you can use others peoples parts however you have to give them credit by disclosing this. When I look at miniature work I get more impressed when the artist has made everything including those things they are not known for. I suspect this will apply to the judges a help that person score extra "points". 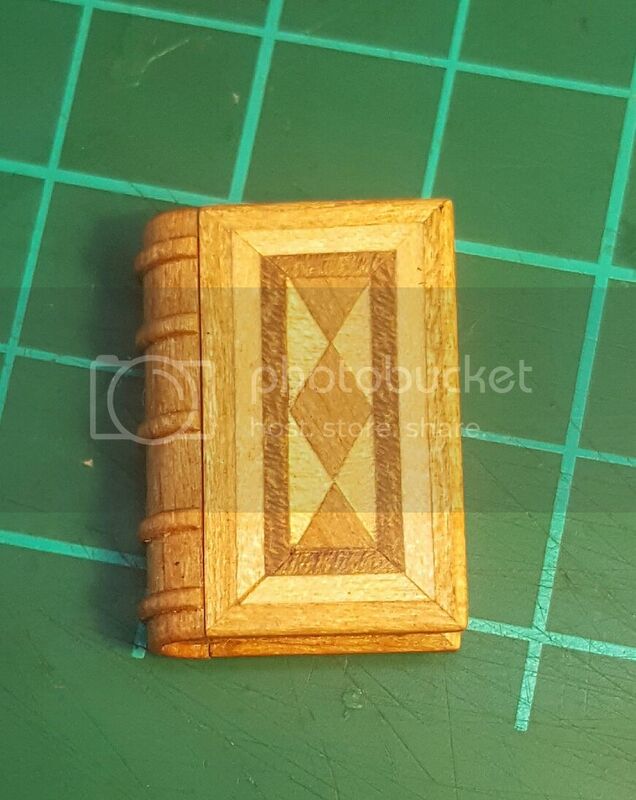 One of the pieces that I will have for sale at the Masterworks show, a tiny wooden box with a secret drawer in the shape of a book based on a real antique dating from the 1840's. As small as this is it turned out to be a lot more work time wise than what I expected...so what else is new! The finished book is made from birch, cherry and imbuia...basically because these are softer and easier woods to work with and I am teaching this as a class at our local club. The other wood combination is made from three South African woods namely mopane, yellowwood and blackwood and the ones made from this wood combination are the ones that will be for sale. >>>As small as this is it turned out to be a lot more work time wise than what I expected...so what else is new! EVERYONE in the forum should like this statement! Looks like a fun piece to create. KC is going to be an event to remember! Do we have times of events yet? It might help those of us planning to fly. We are getting ready to release the whole weekend details pretty soon. There will be the public activities held at the museum, Fri. to Sun. There will also be a IGMA sponsored party for the artists Thurs. and I will be hosting a open house/shop tour Sun. Evening.... Keep watching this forum for details. Hi Mini Collectors, the Toy and Miniature Museum now has ticket sales and additional info loaded about the events... I wonder who will be number 1 in the door on preview night? I was 2nd once in the door at the Guild Show... it was a fun wait... ask me when you see me how early you have to get up in the morning to be 2nd in line for the Guild Show. Oh, I wonder what exquisite miniatures will be available at this show? Are there any rules about general merchandise previews on the Guild's websites? I hope to see lots of forum members at the Masterworks event! Are you ready to buy your ticket for Friday night? The Nelson Atkins Museum is closed on Monday & Tuesday. Is there anything in this museum that you know is a must see?